People are mourning the loss of Glenn Rightsell, the man shot and killed by an Indiana State Police trooper on Sunday north of Crawfordsville. CRAWFORDSVILLE — Family and friends said the shooting death of a Linden man on Friday by an Indiana State Police trooper is senseless. 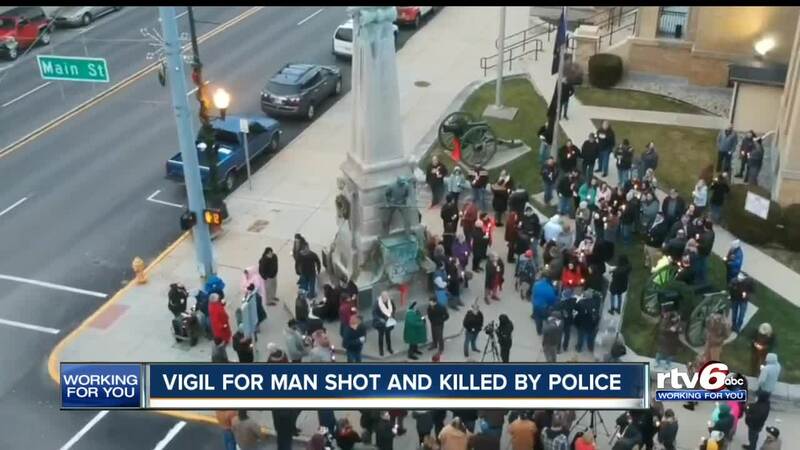 On Sunday, the family and friends of Glenn Rightsell came together on the corner in front of the Montgomery County courthouse to praise Rightsell. He was reportedly working on a disabled SUV aong the side of the road on U.S. 231 north of Crawfordsville on Friday when a state trooper noticed the activity, along with a gun on his waistband. State police have said Rightsell allegedly reached for the gun, but some at the vigil aren't convinced. "No way can I see Glenn doing the things this officer said," Jeff Jirtle, Rightsell's friend, said. "If he reached for his gun — it's a [expletive] lie. Glenn would have never done that. Glenn, his heart was pure." Another friend wore a jacket describing Rightsell as an angel. "It was senseless, senseless what happened," J.P. Shirley, Rightsell's friend, said. "I know the good Lord's got another angel with him." The name of the trooper has not been released. The state police investigation into the shooting remains ongoing. The agency will file a report with the Mongtomery County Prosecutor's Office to determine if any charges are warranted.